Muriel pictured on the left. Listening to the radio, whilst ironing, back in 1986, I heard an appeal for teachers to go to Brixton. Following the riots, Brixton was a ‘no-go’ area. People had fled and classes were unstaffed. I was a Primary School teacher and, at the end of seven years in a ‘leafy green’ Beckenham school, I was completing a year off to do an OU degree. I volunteered to supply for two weeks in Brixton. It was tough but I loved it and stayed twenty years! Whilst there my Poetry Club evolved and I became a regular user of the National Poetry Library on the South Bank. One day I glanced at a notice on a display board announcing the centenary of a Poetry Circle. I was intrigued to know how any such society could last 100 years and read further. 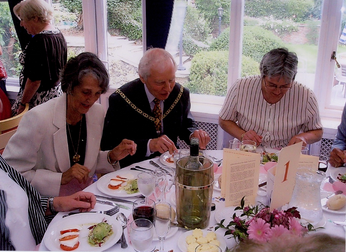 Shortlands Poetry Circle, which met fortnightly at Ripley, was to celebrate its centenary in July 2011. I live within walking distance of Ripley – how had I missed it? So I joined. For years I shared poetry with the children but SPC widened my horizons from John Donne to Gerard Manley Hopkins, with a flippant dash of Joyce Grenfell. For some strange reason I remember a crazy poem by Paul Durcan about a Toothbrush! In addition to our meetings we have read at the district hospital and entertained diners at a local restaurant with ‘food’ poems. We go to poetry readings and concerts and have enjoyed memorable evenings at Langley Park Boys’ School with the pupils entertaining us with their considerable talent. I am so glad I found SPC – I love it! This entry was posted in Member Profiles, Ripley Arts Centre, Shortlands Poetry Circle and tagged Muriel Letman, Poetry Circle, shortlands poetry circle on November 26, 2014 by shortlandpoetrycircle.